has released total 25 Apprentices vacancies at its Operating Locations in South India (Tamil Nadu & Puducherry, Karnataka, Kerala, Andhra Pradesh, Telangana). Candidates fulfilling eligibility criteria can apply in relevant discipline using the official website of IOCL @ www.iocl.com. IOCL application link activates from 20-09-2018. Last date for IOCL Southern Region Recruitment applications is 12-10-2018. Selection method for the engagement of candidates for Trade Apprentices vacancies is written test and personal interview. Written test will be held at Chennai, Vijayawada, Hyderabad, Bangalore and Cochin in November-2018. For regular updates regarding IOCL Tamil Nadu & Puducherry, Karnataka, Kerala, Andhra Pradesh, Telangana Trade Apprentices Recruitment, visit the official website. For more details of Application process, selection process, age limit, Important dates, age relaxations of Indian Oil Corporation Limited Southern Region (Tamil Nadu & Puducherry, Karnataka, Kerala, Andhra Pradesh, Telangana) Trade Apprentices Recruitment are stated below. Total available vacancies in IOCL Southern Region Recruitment are 354 posts. e. Andhra Pradesh: 44 posts. See the notification for category wise vacancies. Candidates will be paid monthly stipend of Rs 2500/- for Trade Apprentices towards Stationery, Miscellaneous, Conveyance expenses. Age of the candidate as on 19-09-2018 is 18 years to 24 years. For SC/ ST upper age limit is 29 years and for OBC candidates is 27 years as per rules. For PWD candidate age will be relaxed up to 10 years. Trade Apprentice Fitter: Matriculation with ITI fitter course for a period of two years. Trade Apprentice Electrician: Matriculation with ITI Electrician course (two years). 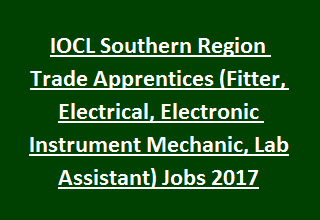 Trade Apprentice Electronic Mechanic: Matriculation with ITI Electronic Mechanic course (two years). Trade Apprentice Instrument Mechanic: Matriculation with ITI Instrument Mechanic course (two years). Trade Apprentice Laboratory Assistant: Full time BSc degree in Maths, Physics, Chemistry/ Industrial Chemistry. Candidates will be engaged for IOCL Southern Region Trade Apprentices Vacancies based on their skills in written examination and personal Interview. Written test consists of objective type questions on relevant discipline and some questions from general knowledge, Awareness & reasoning. The time duration is 2 hrs. Written test will be held at Chennai, Vijayawada, Hyderabad, Bangalore and Cochin. Candidates are advised to check the IOCL website regularly for updates. All candidates with eligible criteria are advised to visit IOCL official website www.iocl.com. Read the full advertisement carefully before applying for Trade Apprentices jobs in IOCL Southern region recruitment. Application forms available from 19-09-2018. Closing date for submission of application forms is 15-11-2017.